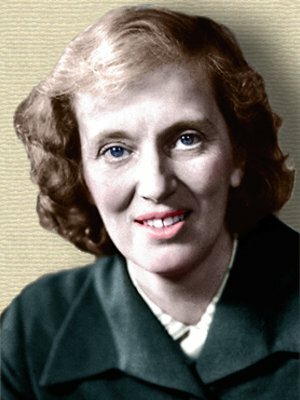 English biochemist and X-ray crystallographer (née Crowfoot) who was awarded the Nobel Prize for Chemistry in 1964 for her discoveries of the structure of biologically important molecules, including penicillin (1946), vitamin B-12 (1956), and the protein hormone insulin (1969). Oxford Dictionary of Quotations, 6th ed. 12 May - short biography, births, deaths and events on date of Hodgkin's birth. 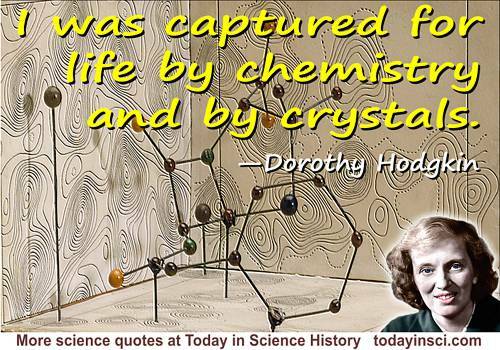 Dorothy Hodgkin: A Life, by Georgina Ferry. - book suggestion.